Yonanas has been appearing on television shows such as Dr. Oz, The Doctors, and Good Morning America as a healthy and easy at-home dessert maker. Bring home your favourite frozen yogurt treat, minus the sugar and dairy - not only saving calories, but saving your fruit from going bad, and saving you money as well! We were excited to use up bananas that were just about to become over-ripe - but keep in mind that all fruit must be frozen 24hrs prior to making Yonanas. 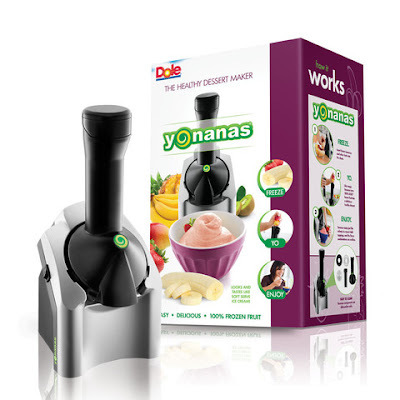 The machine itself is pretty straight-forward to use, just place the fruit in the chute, press down, and receive Yonanas! However, right off the bat we found that while bananas came out in a smooth consistency, other fruit didn't seem to achieve the creamy texture we were expecting. In addition to bananas (which we were very happy with), we also tried strawberries, grapes, and blueberries. We found that we ended up with creamy banana "yonanas" with fruit flavoured shaved ice on top. Did we hate it? Definitely not. But it certainly didn't perform in the way we had hoped. Ultimately, we decided that as a tool that produces creamy frozen bananas - it was a bit much. Too expensive, and took up too much real-estate on the counter-top. The good news, however, is that they have a solid money back guarantee which made returning the product pretty painless. Craving banana ice cream after reading this review? No worries! We've got some ideas for making your own banana ice cream at home, with tools you probably already own. Same health benefits, and even easier on your wallet. That's a win! We're tossing a bunch of ripe bananas in the freezer now, and will be back with a step-by-step recipe post later in the week, so stay tuned!